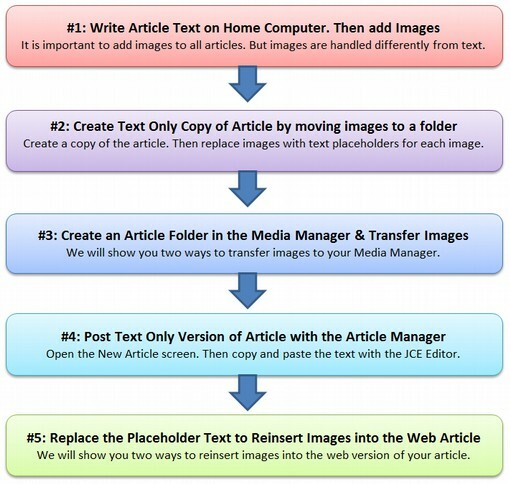 This article describes 5 steps for writing and posting a Joomla article. These five steps are done every time you want to add a new article or a new page to your website. We will cover Steps 1 and 2 in this article, then Step 3 in the next article and Steps 4 and 5 in the final article in Section 4. Welcome to our website. Our mission is to help you! We offer all kinds of tips to help you achieve your goals. We also provide resources to help you! Finally, we provide a network to help you reach others. Call for Action: Feel free to contact us with any questions you may have! Most articles and web pages are simply a combination of text and images. A common problem with websites is that they contain too much text and not enough images. As a rule of thumb, there should be at least as much space taken up with images as there is with text. Before posting this article, let’s first review how to get images to add to your article. In the above example, we wrote our first article, called Welcome to our Website. We had four images in this article. But where did they come from? The Internet is very visual. Take your time to find images which support your ideas. Use as many images as possible which show people and especially showing children. Charts, graphs and tables can also be copied as images. Images often convey much more information than text and help readers, and especially beginners, better understand the message you are trying to convey. Avoid simply putting in a bunch of text on your web pages. One way to get images for your articles and slide shows is to take them with a digital camera. Another is to capture images and screen shots from the Internet using a screen capture tool. In Linux, there is an excellent free screen capture tool called Shutter. In Windows, you can use a free program called Snag Screen. Before posting any images to the Internet, we will need to optimize them. The file size of a normal captured image is over 100KB. Once we are done writing our article and adding all of the images we want, assuming we are using Libre Writer, we can go through the article and right click on each image. Then click Compress. This will turn the image into a JPEG image and also reduce its file size for the web. After making sure that all the images in your article have a small enough image size and file size, we are ready to create a text only copy of the welcome article and place all of the welcome article images in the images/frontpage/welcomearticle folder. We have previously created a folder structure on our Home computer. This folder structure includes the root folder for your website with an articles folder inside of that and a 00Welcome Articles folder inside of that. After your first article is written, put the document complete with the 4 images in this folder and call the article file 00 Welcome to our Website. The path to this article on your home computer will be mywebsite/articles/00 Welcome Articles/00 Welcome to our Website. Note that each article above is listed twice. The duplicate article has a W in front of the file name to indicate that it is the Web Version or Text Only version of the article. To create this Web version, copy the article and save it AGAIN in the same folder as a new and separate file called W00 Welcome to our Website. Thus, you will have TWO versions of each article. Next, close the first Document and continue working with the WEB version of your Welcome article. Here is what the web version will look like. Note that before removing the images, and replacing them with “placeholder text” this document is an exact copy of the original document. Next, if you haven’t already done so, create an article image folder for this article inside the front page category images folder we created previously on your home computer. Name the image folder 00welcome. 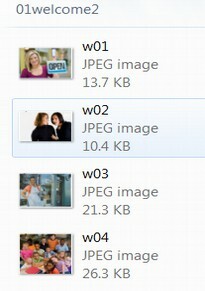 Inside of this 00welcome images folder will be the four images of the welcome article. This should be numbered w01, w02, w03 and w04. So the path to the first image in the Welcome article on your home computer will be mywebsite/images/00welcome/0owelcome/w01.jpg. To be clear, each of your website articles will require making a folder for its images. If you have a lot of images in your article, it is useful to number them to keep them in order. The first number refers to the article (they are all in the same article). The second number is the image number in the article. Text Only (web) VERSION of Welcome to our Website! Note that the web version does not have any actual images. It now consists only of text – with the w01, w02, etc indicating where the images should be inserted back in to the text one the text itself has been copied and pasted into the website article. Note that all of the images are under 50 KB. Now that you have created a WEB or TEXT ONLY version of your Welcome Article and your Welcome Article images are organized and placed into their proper folders in the mywebsite/images/00welcome/0welcome folder on your HOME computer, it is time to copy each of these four images into a similar folder on your website server. That is the subject of the next article.